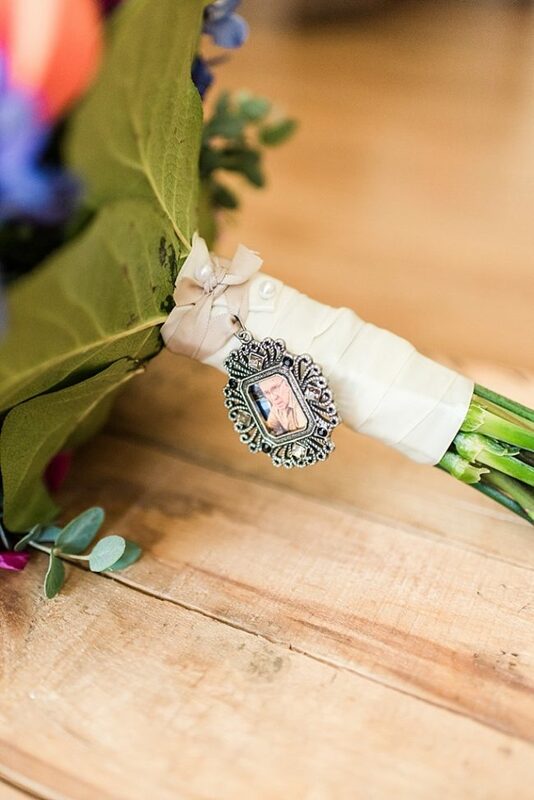 After falling in love with an unattainable antique necklace that she saw in a magazine, Michelle reached out to have me make a custom set of wedding jewelry for her using that necklace as inspiration. 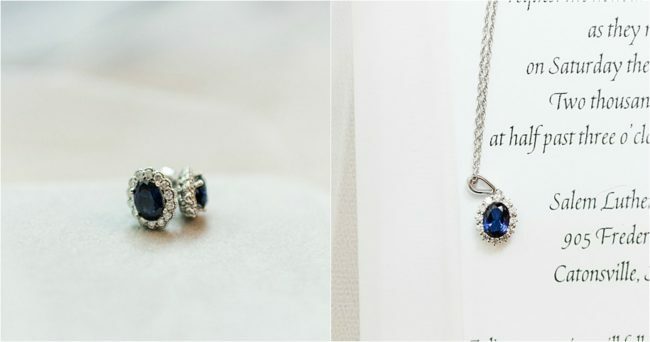 Scroll down to see how she styled her custom sapphire wedding jewelry set! 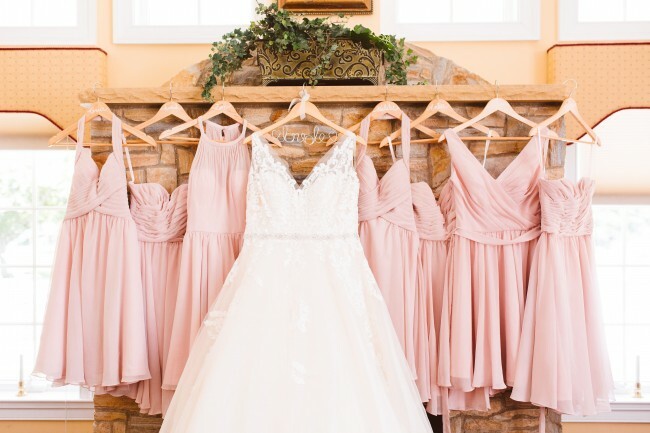 Michelle’s personal style is one of classic elegance with sentimental touches. 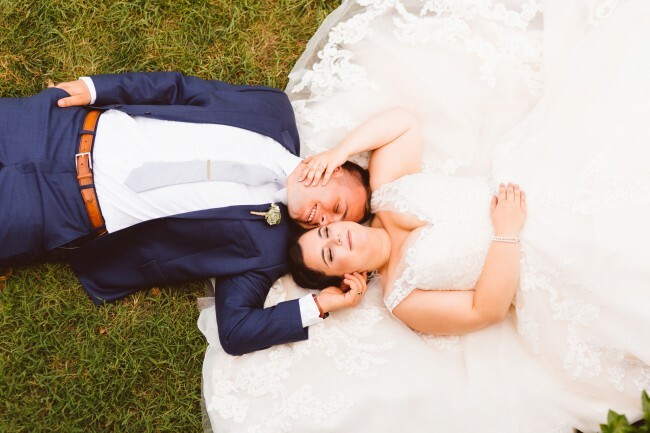 She combined timeless pieces like her solitaire diamond engagement ring with personal details like hairstyling from her long-time friend Erica Cote of Silver Immersion. 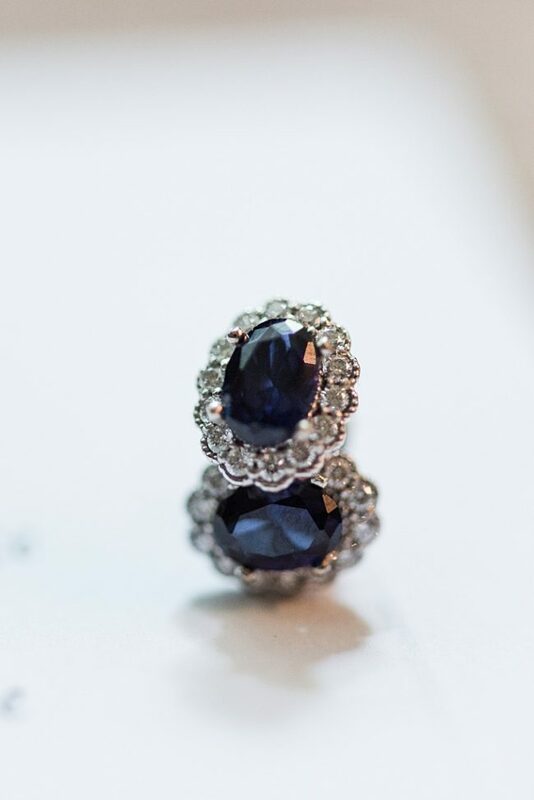 Her sapphire jewelry set represents both of these important elements as accessories and new heirlooms. 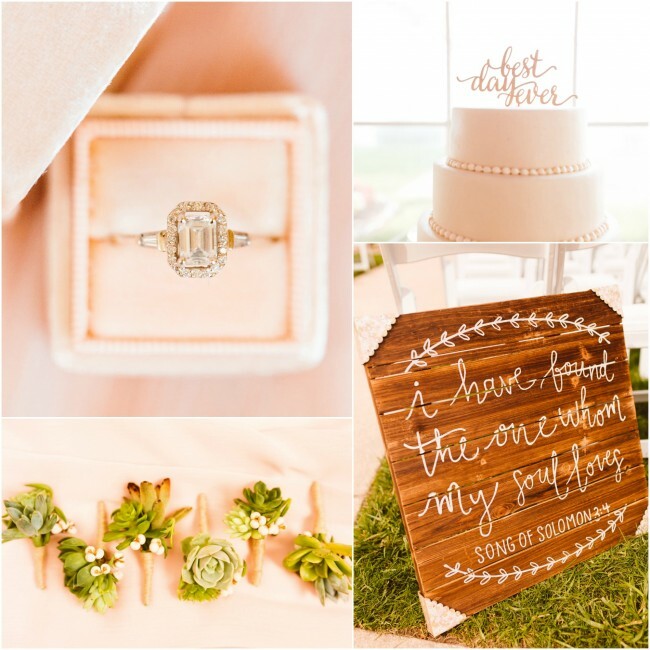 The style is ageless; and Michelle will enjoy remembering the happiness of her wedding day whenever she wears these special jewels. 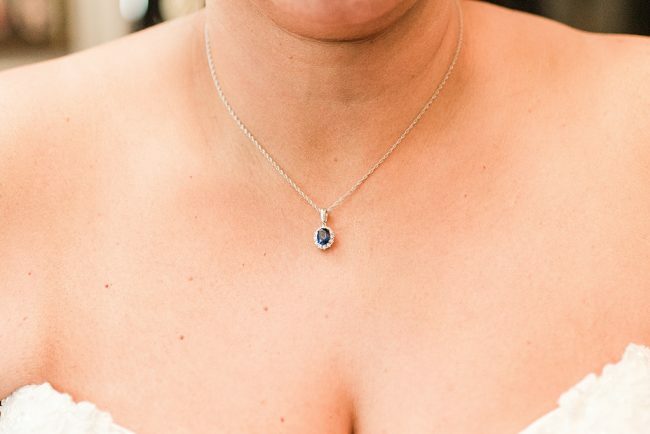 Michelle’s sapphire and diamond halo earrings and matching necklace were bespoke designs. 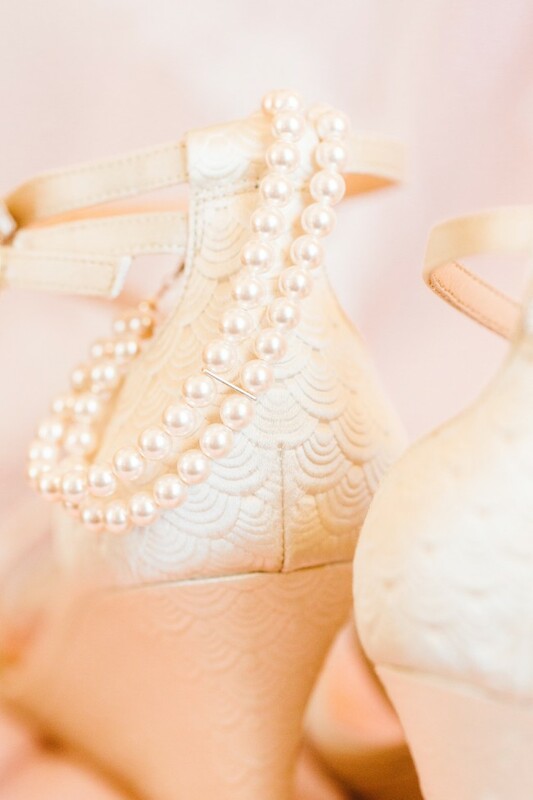 To inquire about similar custom bridal accessories for your wedding, send me a message! 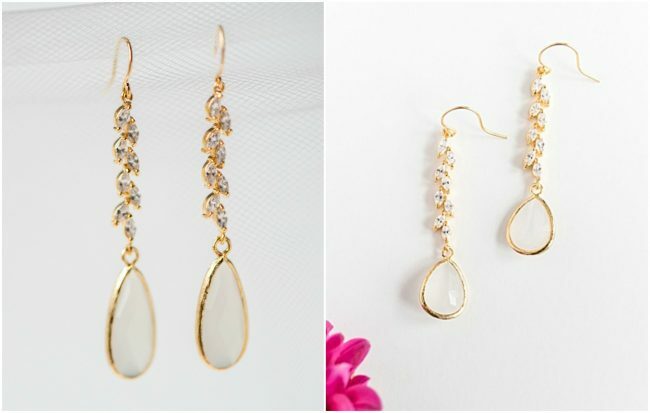 Today I’m sharing a real-life example of how to order custom jewelry based on a pair of bridal earrings from my shop! 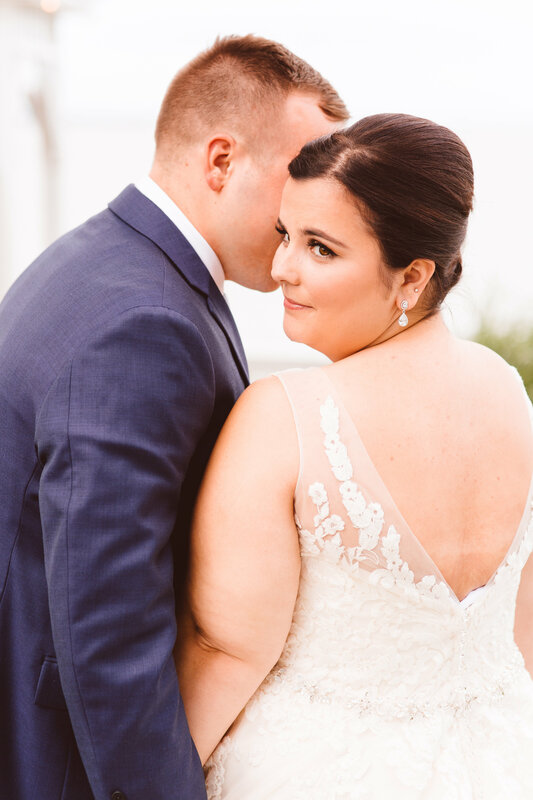 When #jadornbride Rachel first reached out to me, it was because she had fallen in love with a pair of beautiful bridal earrings from my collection. 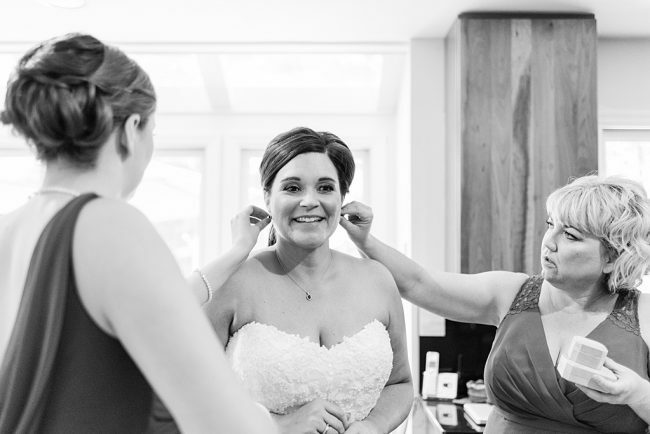 However, she was looking for a slightly shorter pair of earrings for her wedding in Germany. 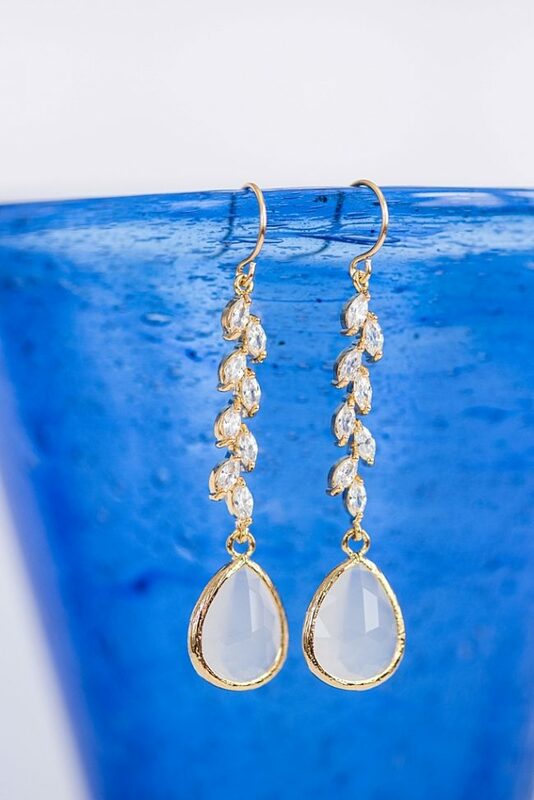 I assured her that she could have both the size and look she wanted and I worked with her over a series of emails to customize the opal and gold vine earrings she loved into a pair that was perfect for her! 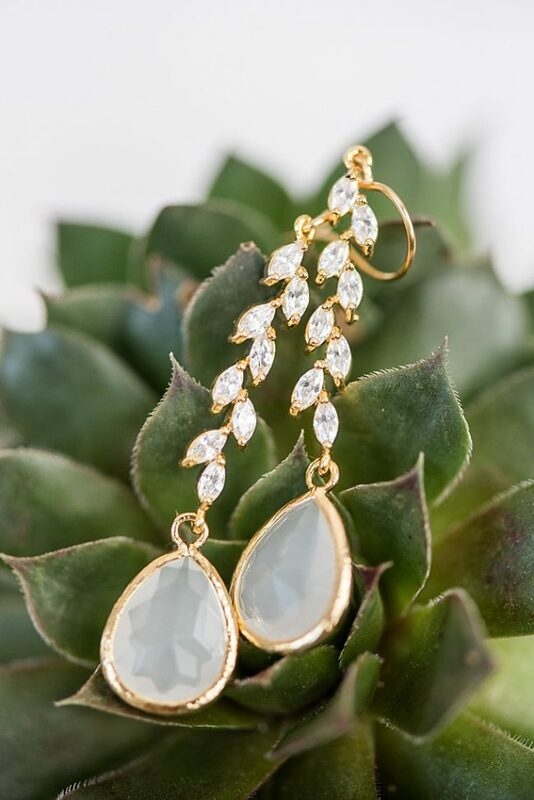 The original pair of gold bridal earrings that Rachel fell in love with featured long opal teardrops below a delicate crystal vine. 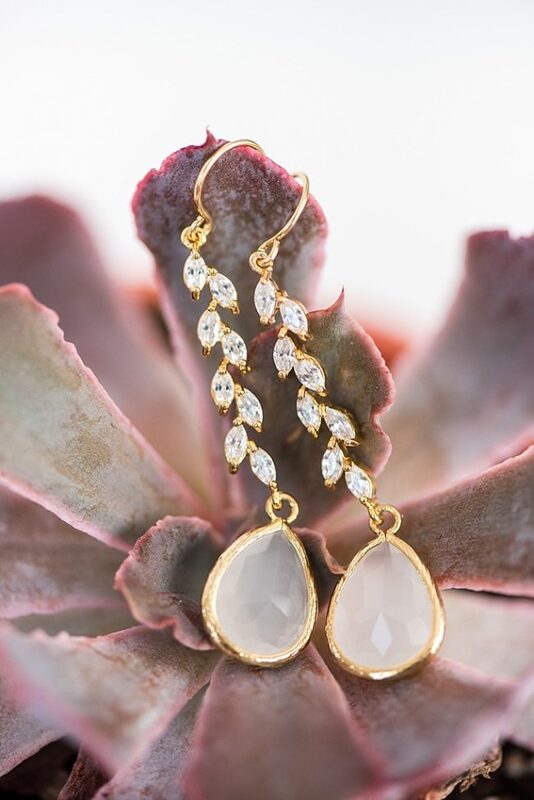 To make them slightly shorter I swapped out the long teardrop for a shorter opal teardrop stone. 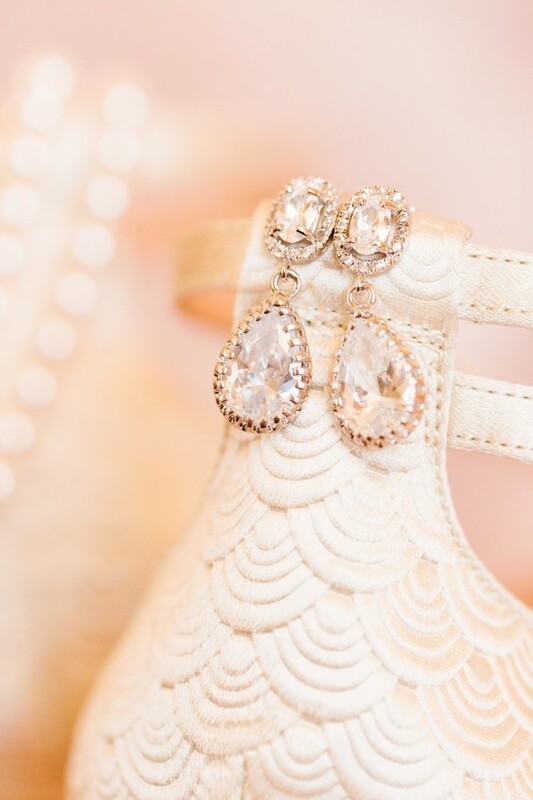 I couldn’t be more pleased with the way the customized pair of earrings turned out, and their #jadornbride agrees! 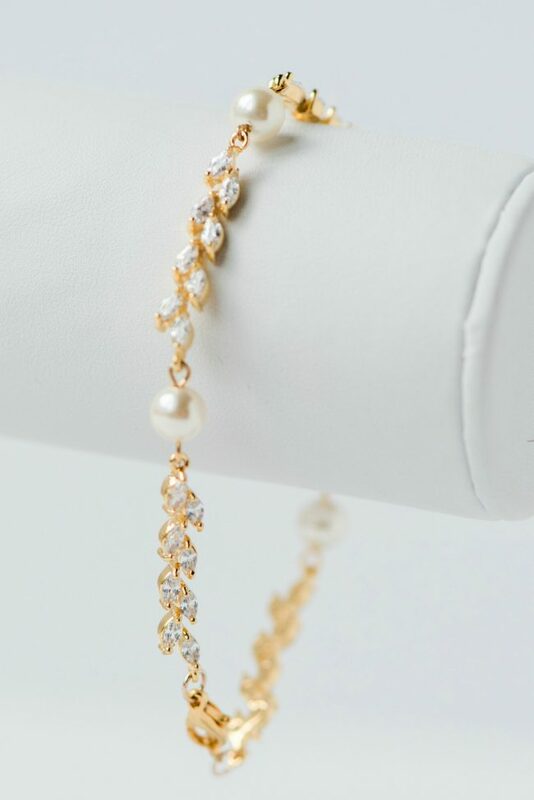 Rachel also ordered a matching bracelet to complete her bridal jewelry set: the Crystal Vine and Pearl Bracelet (pictured below) from the J’Adorn Designs jewelry shop. I custom-sized this piece for her as well because she thought it might be too big for her tiny wrist. 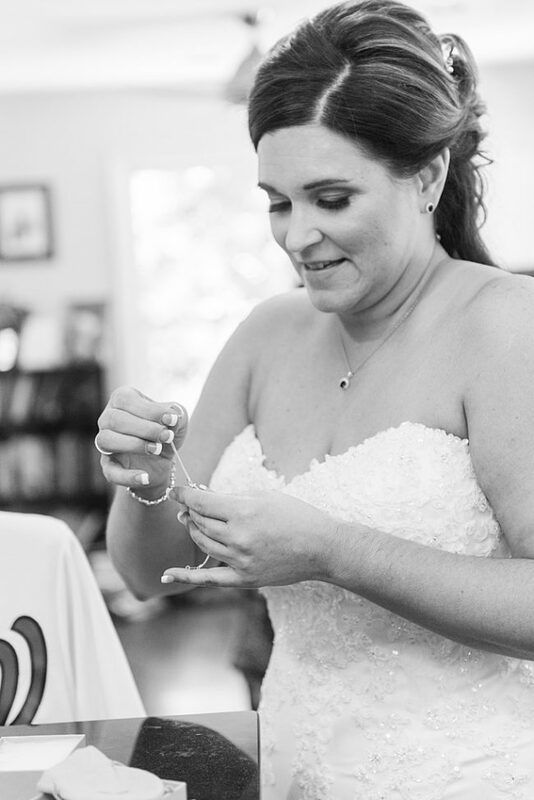 I simply removed one of the vine links and added a small gold extender chain to ensure the perfect fit for her bridal bracelet! 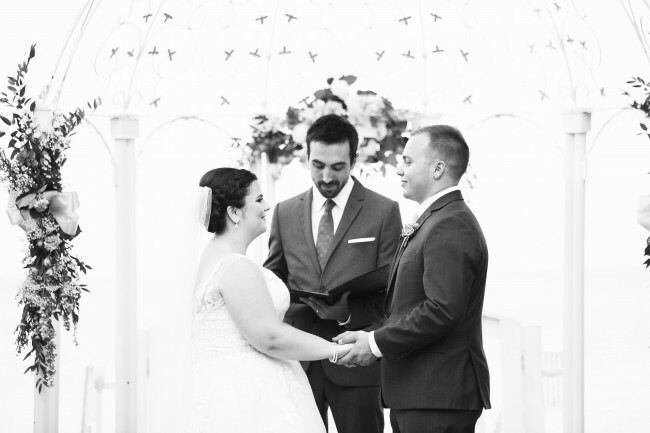 When Jill and I met for her initial design consultation, I knew almost immediately that her custom bridal jewelry was going to be special. 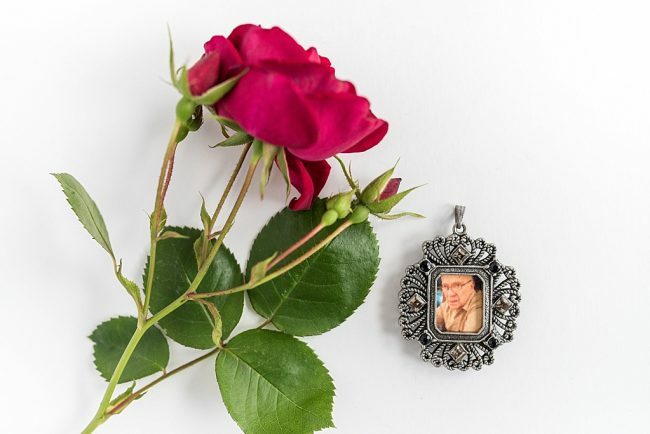 As I shared in a previous post, I created a coordinating set of accessories for Jill to wear on her wedding day. 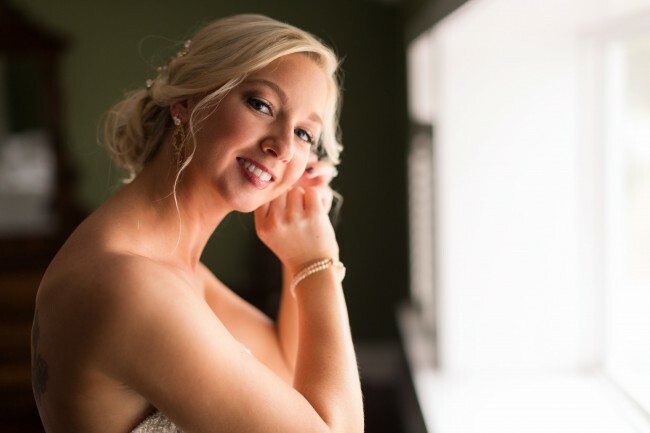 This set included a double stranded pearl bracelet, two pairs of earrings, and a golden hair vine with elements in blush, pearl, and crystal – the perfect elegant wedding day look! 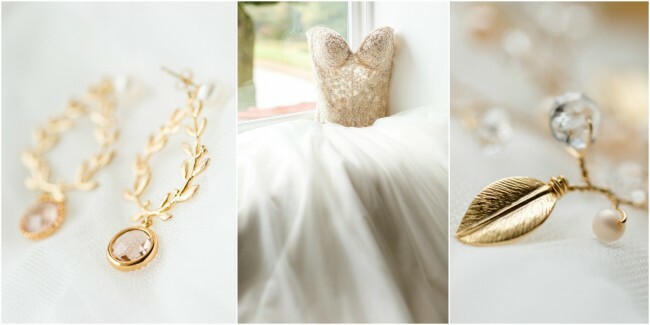 Today I’m sharing a look inside how she styled these accessories with her beautiful gold and ivory gown on her wedding day. 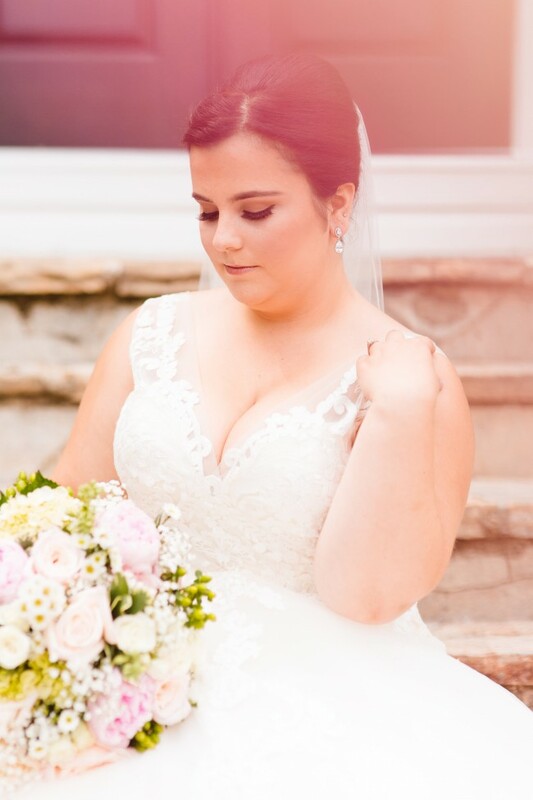 Jill’s wedding gown was simply stunning, with its sweetheart neckline, intricate gold details, and soft billowy skirt. 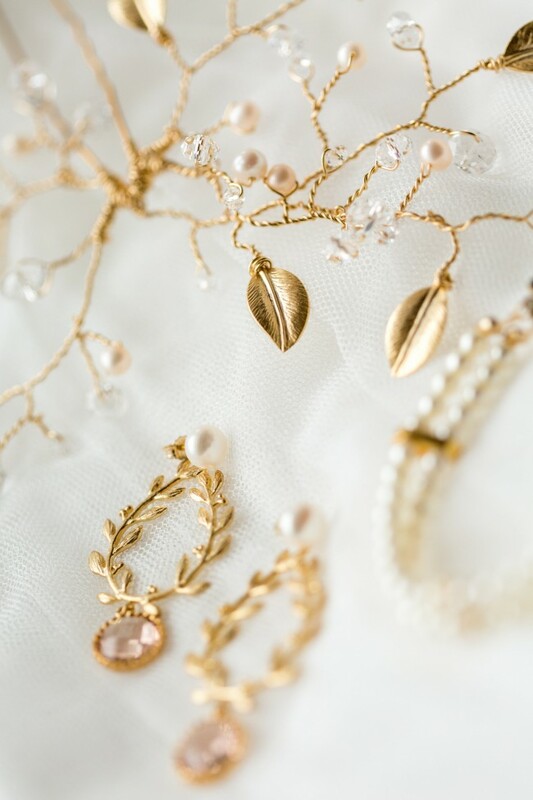 The gold beaded belt she added was the perfect complement to the elegant gold jewelry with blush pearls, metallic leaves, and diamond white crystals. 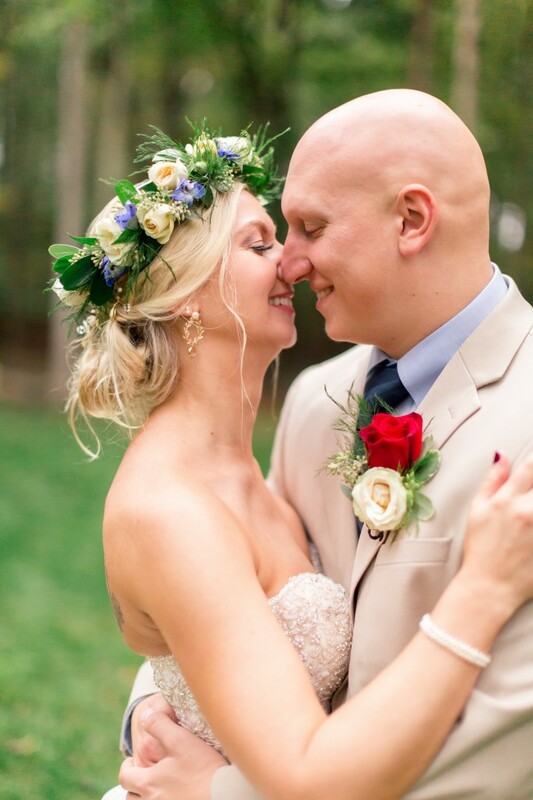 Her custom hair vine was molded perfectly by her hair stylist to complement the low, boho-style updo she chose for her blonde hair. 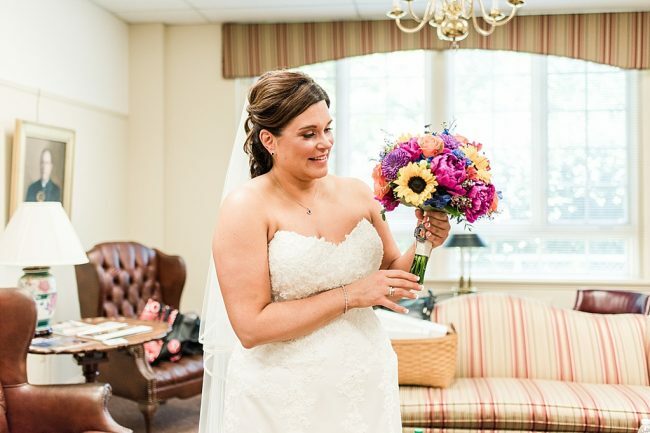 A Maryland-based artisan herself, Jill wanted to support local small business as much as possible while selecting items for her wedding. 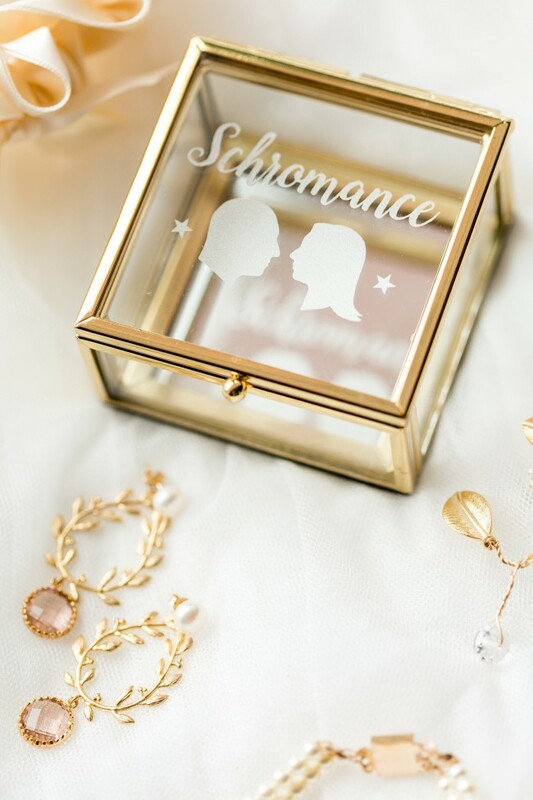 She chose The Garter Girl to make her stylish ivory wedding garter and Eikoh Design Studio for her customized glass jewelry box. 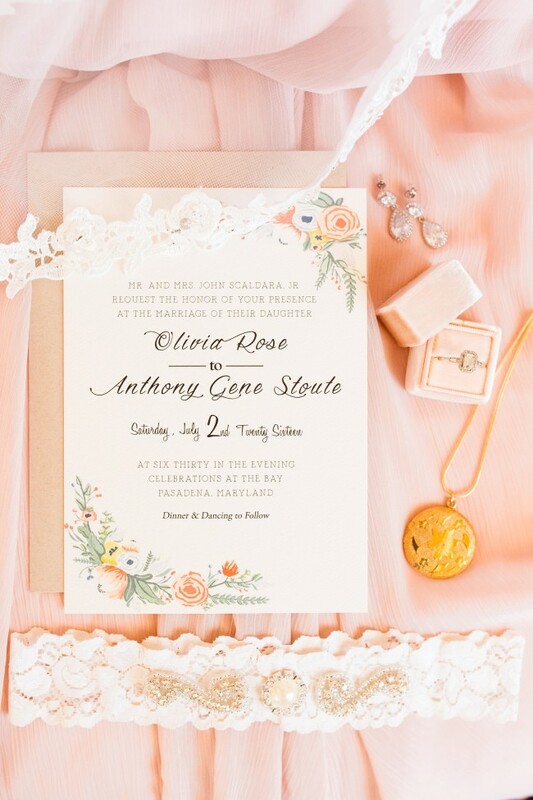 I think all of the details came together perfectly, don’t you? 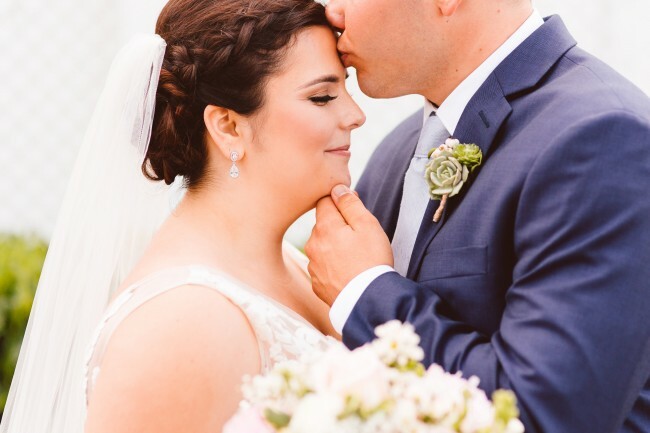 Even though the accessories and details at this wedding were pretty darn close to perfect, the most beautiful part of the day was the love that Jill and Eric so clearly have for one another. 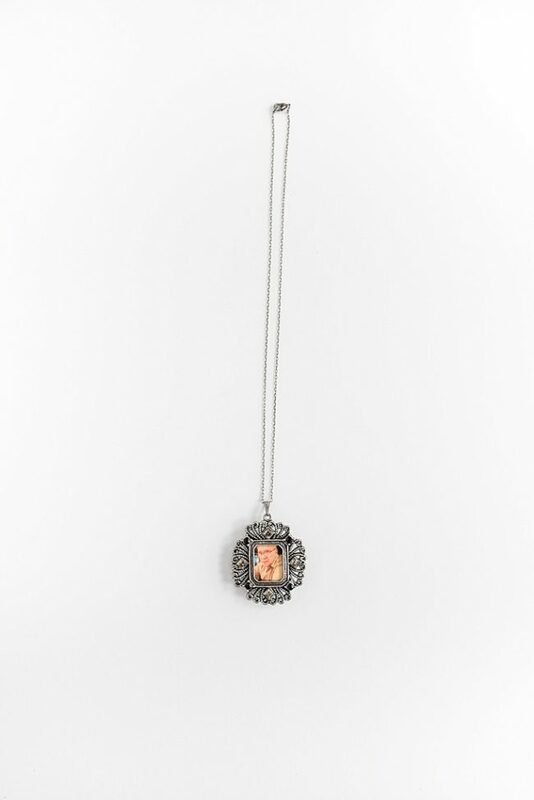 It shines through every picture! 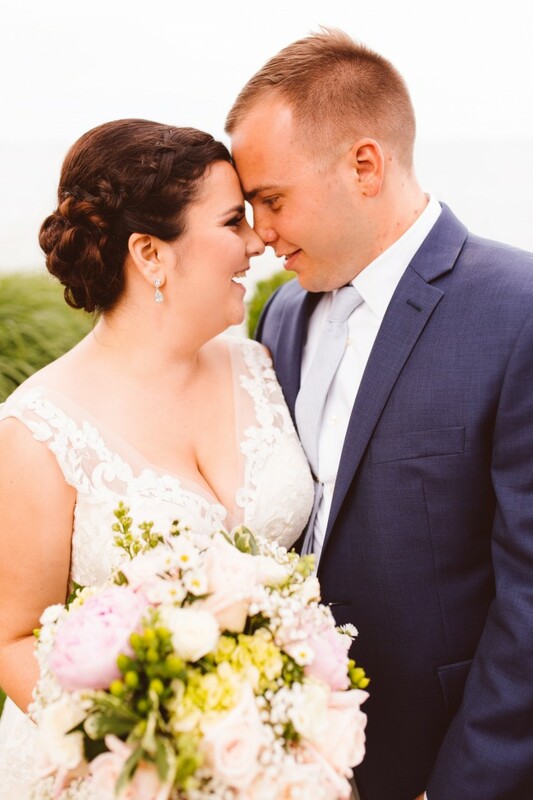 To Jill and Eric, the newlyweds: may your new life together as husband and wife be every bit as beautiful as your elegant wedding day was (even if it can’t be as perfect!) 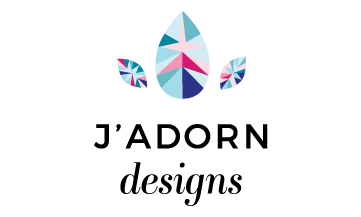 Thank you for choosing J’Adorn Designs to create your elegant wedding accessories! 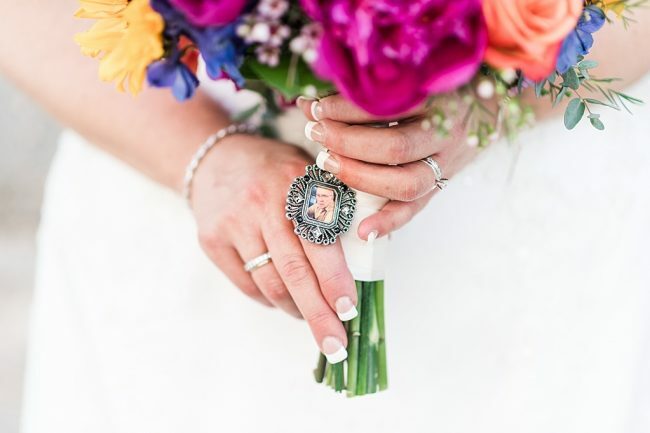 Her custom hair vine and second-hole accent earrings were bespoke designs. 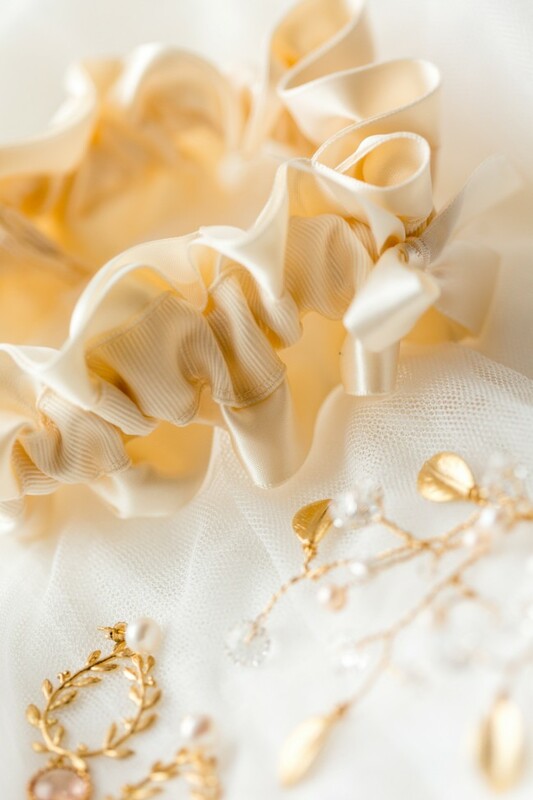 To inquire about similar custom bridal accessories for your wedding, visit the Contact Page.